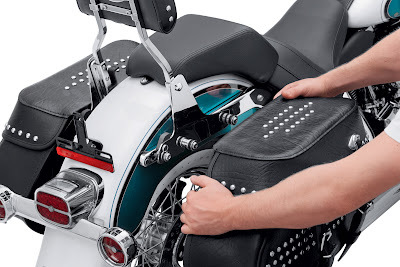 MILWAUKEE, The new Heritage Softail® Classic Quick Detach Saddlebag Conversion Kit (P/N 90200641, $179.95) from Harley-Davidson Genuine Motor Accessories® converts Original Equipment fixed-mount saddlebags to bags that can be removed in just seconds. The saddlebags release with a pull and twist of a locking handle within each bag to give the motorcycle a clean, stripped-down look. The exclusive three-point mounting system distributes load to minimize saddlebag flex and bounce, and retains the Original Equipment weight capacity. This kit fits 2003-later Harley-Davidson Heritage Softail Classic model motorcycles equipped with Original Equipment saddlebags. Installation requires separate purchase of appropriate Docking Hardware Kit. See an authorized Harley-Davidson dealer for fitment details.